You can never have enough Nightmare Before Christmas collectibles and this rotating musical carousel sculpture proves it. This officially licensed Disney decoration is hand-sculpted, handcrafted in artist’s resin and has been hand-painted in exquisite detail. All of your favourite characters have come to the carousel; Jack Skellington and Sally are riding a wooden horse, Zero is floating around merrily, the Mayor is riding a creepy carousel car and Lock, Shock and Barrel are cooking up mischief in a bathtub (of course). Even Oogie Boogie has taken a break from plotting nefarious schemes to take a ride on the carousel! As soon as the music starts playing you won’t be able to keep still. This captivating carousel plays the fantastic ‘Overture’ music from the beginning of the movie that guides viewers on their way into Halloweentown for the very first time. 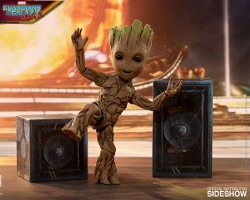 When you listen to this melodious tune, you’ll be reaching for your copy of the movie right away and wondering why they haven’t made a live-action musical version of it yet! You can lose yourself taking in all the intricate designs of this breathtaking carousel sculpture. An incredible eye for detail has been shown at every twist and turn; from the illuminated pumpkins, tombstones and Halloweentown residents adorning the top of the carousel, to the Jack skulls, iconic lettering and the orange and black snake coiled around its base. Sitting atop this Halloweentown carousel is Spiral Moon and a luminous moon. As it rotates you’ll see that one side of the moon features a silhouette of Jack and Sally together at last whilst the other side shows the ominous figure of Oogie Boogie looming over them all. Unlike many musical sculptures, this carousel has a knob that you can use to control its volume. Ideal if you just need one more round of‘Overture’before going to bed but don’t want to wake anyone up! The three-way switch on this carousel sculpture means that you can also control the lights that illuminate the moon, canopy and seven glowing pumpkins. You can even control the rotating movement of the carousel itself and it all operates on an AC adaptor that comes included. This highly detailed musical carousel sculpture is mesmerizing to look at and wonderful to listen to. 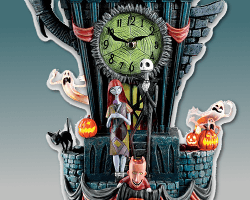 An ideal gift for yourself or a fellow Nightmare Before Christmas fan, this carousel is the perfect decoration for both Halloween and Christmas. Actually, if it was up to us, we’d have it displayed in every home all year long! Check Christmas Decorations and Halloween Decorations for more Christmas and Halloween inspiration.